Ordering from the Headway website was very quick and easy, and the standard delivery to mainland UK, was both fast and free. Sadly though, the unit I received was faulty. Getting a replacement from Headway took a sterling effort. Several emails, some audio recordings of the fault and eventually, a slightly heated telephone call with the boss of Headway (a professional PR person might be a good idea! ), and eventually they agreed to send me a replacement (Originally they would only offer to repair the faulty unit they sent me!). I returned the unit via Royal Mail special delivery at a cost of £8.50. I was told point blank that no refund for the return postage would be offered. Therefore the original free postage was cancelled out. I received the replacement EDB1 a couple of days later however, in true comedic fasion.. Headway sent me the wrong power supply adapter and forgot to include the user manual and the extended guarantee registration card. It took 20 days for Headway to forward them on to me.. I made up two leads for the EDB-1. 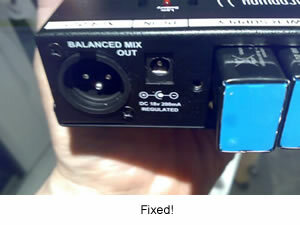 One for blending my violin embedded bridge piezo / shock mounted miniature mic via the EDB-1's on board controls. And another for the ability to use the EDB-1 for the Piezo only and my own design MicroDI to feed the condenser mic to a mixing desk, used mainly for my personal monitor mix. Whilst in conversation with Headway's boss regarding the noise fault on the first unit and the inherent noise level of the EDB-1 generally. I was told that the EDB-1 was not designed for professional studio use. Hmm.. Surely if a preamp / DI box is too noisy for pro-recording how can it not be so in a pro-live environment? Through a 20k rig for example.. This must seriously limit the target market for the EDB-1. However during some quite extensive testing in my studio, and with careful use of the gain settings I found the EDB-1 to be quite satisfactory for recording. How does the EDB-1 compare to the L R Baggs Para DI? I think it would be unfair to compare these two units as they are actually quite different. Though in my opinion both these DI boxes do have one thing in common. A fatal flaw! Let me explain..
A very high impedance in the order of several mega ohms is required to properly match the impedance both of ceramic and other types piezo pickups. The Baggs has a 10 meg ohm input and the EDB-1 has seleclable 5 / 15 meg ohm input, both recommended for connecting piezo pickups. The problem here is that this seriously restricts the length and type of instrument connection cable you can use. And even with optimum signal transfer, the fact that the connection is very high impedance increases the risk of noise and interference. This was the strategy behind the design of the MicroDI. This has an optional remotely powered jack plug shell-mounted hi z preamp. 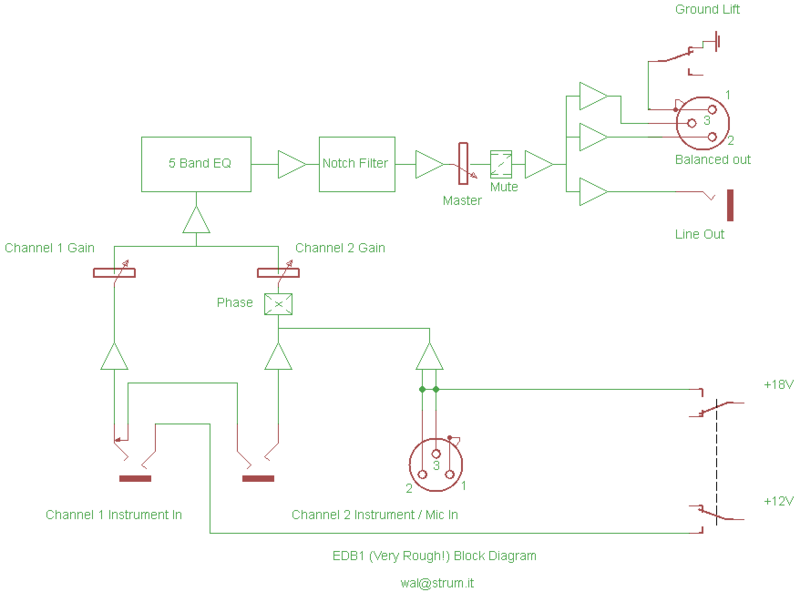 The signal is then converted to a medium impedance which in turn is sent down the instrument cable to the di box. Therefore the hi z part of the circuit is where it should be.. On the instrument!. 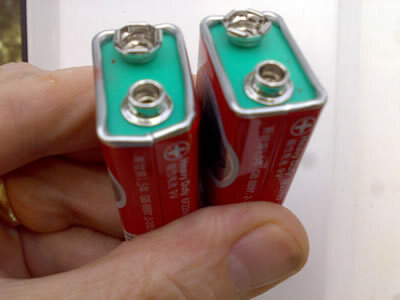 I'm certainly glad I checked the batteries as one of them sent with the replacement EDB-1 had been squashed to the point of splitting. 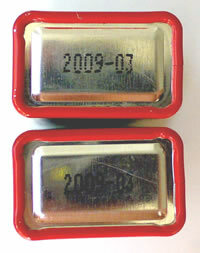 And assuming this is the end of date stamp, the batteries are also out of date! I replaced them both with a fresh pair of Duracells. 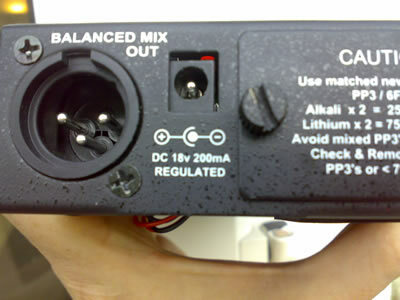 PCB mounted dc power sockets really do need the extra support provided by the cut-out in the enclosure. This helps protect the socket from the up down / sideways stresses of everyday use. Without this, the socket is simply held in place by the soldered connection pins on the PCB. I didn't like the look of this one, so I set about investigating what the problem was. Voiding the guarantee, I stripped the EDB-1 down to find that the whole PCB was out of alignment and in fact slightly buckled. I had to de-solder the XLR connector just to get the PCB out of the enclosure! And as it turns out.. This was the problem. 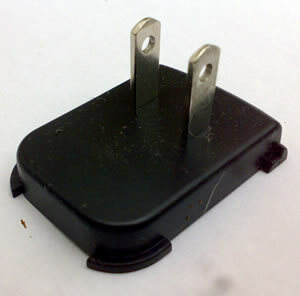 The socket had been soldered off-centre. Once I re-soldered this and several other misaligned parts, I re-assembled the EDB-1 and the DC socket was now correctly aligned with no unnecessary stress on the PCB. Two through-hole capacitors have been piggybacked and glue sticked to the PCB, assumably to correct some kind of error in the design. Though in my opinion rather rough arse, this is a fairly common practise amongst smaller electronics companies and early production runs. I'm not quite sure what the red paint is for.. to hide the values of the components maybe? I can't see it being for shock or moisture protection as this section of the board is mostly populated with good old 062 op amps (very low current but certainly not the quietest). 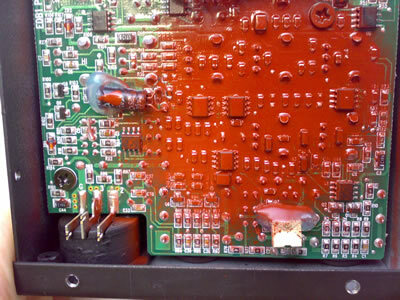 I also wonder how this coating might affect the component manufacturer's specs? What it will definitely do however, is make your local electronics engineer very unhappy once the warranty is up and you need a repair! As can be seen from the photo, the control knobs apear to be stock ones that have been modified by shaving the pointer flat towards the base to fit the EDB-1's front panel. Nothing wrong with that I suppose.. I wonder how much you get paid for doing that job?. I used mine to replace the one that I lost for my Sennheiser IEM 300 body pack receiver. I fear that one might be in danger of developing a serious case of 'Builders Arse' should one attempt to mount the EDB-1 on a belt! I am already working on a few modifications for my EDB-1. 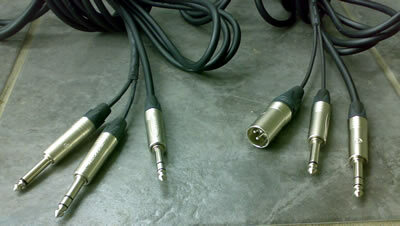 I will replace the anonymous xlr sockets with professional Neutrik A series locking connectors. Add an effects loop via an internally mounted add-on pcb. 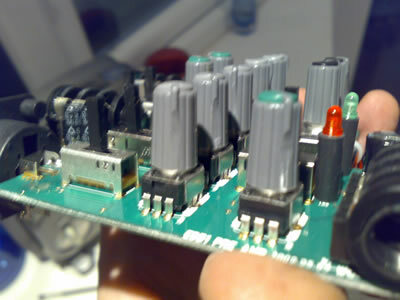 I am also very tempted to replace at least some of the TL062 op amps. With 072s or even TI's Burr-Brown OPA 2134s, to get the noise down a bit however, this would be at a cost of a far shorter battery life and would also require a beefed up power supply. Even after a few issues and the rather odd service from Headway HQ, I can't help but like this unit. The basic design is good. The layout is clear and the functions are both useful and intuitive. The inputs are very sensitive with huge amounts of gain. Arguably in my opinion, too much for your average instruments / mics etc. Though apparently the extra gain is required to match some of the Headway pickups. Therefore carefull use of the Gain and Master settings is required to keep the gain stage noise to a minimum. 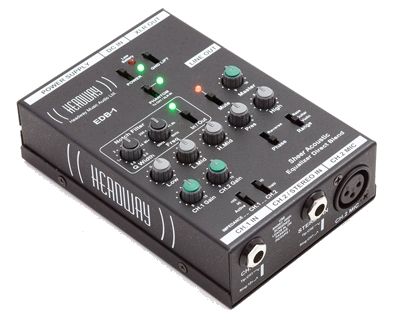 In all honesty though, I would struggle to recommend the EDB-1 to fellow muso friends because of the various issues I had with both the units I received from Headway. If they were to want one though, I would check the unit over myself and if necessary correct any problems at 'mates rates' of course! I would also suggest that they purchase the unit via a retail shop rather than the Headway website to avoid the problems I had buying direct. From a sound / electronic engineers point of view, the absence of a block diagram in the user manual is rather disappointing. As one quick look at this, gives an instant overview of the unit's functionality. Therefore I have drawn a very rough one, guided by the information provided in the the user manual. This diagram was not provided by Headway. Use at your own risk..